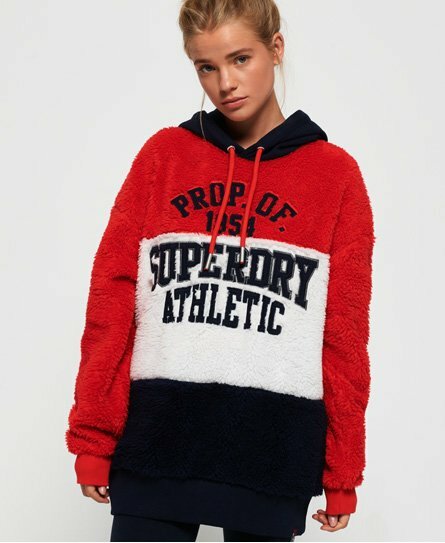 Superdry women’s Blake borg hoodie. Stay cosy as the temperatures drop this season in the Blake borg hoodie, a great on-trend item to have in any wardrobe that anyone can pull off. This hoodie features a draw cord hood, a Superdry Athletic logo across the chest and ribbed cuffs and hem. For the finishing touch, this hoodie has been finished with a Superdry tab in the hem. Team this hoodie with your favourite jeans and trainers for an off-duty look, or team this hoodie with leggings to channel athleisure vibes.